The food and beverage operation is one of the most important aspects in any hotel, large or small. It is also the area where there are the most opportunities to gain entrance into the hotel business. Leading the kitchen operation is the executive chef. Not only does this position oversee one kitchen, but perhaps a number of kitchens, depending on the size of the hotel. 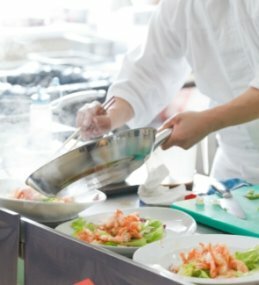 The executive chef will originate and standardize recipes, establish presentation techniques and quality standards, plan and price menus; ensure proper equipment operation and maintenance, and ensure proper safety and sanitation in kitchen. The executive chef will also sometimes oversee catering functions. Just as important as the preparation and serving of the food is the executive chef's ability to turn a profit in the kitchen by ordering accurate amounts of food and reducing food waste, as well as managing labor. Although the executive chef is mostly behind the scenes to the guest, it is an added benefit to the hotel, if the executive chef is a personality that can be marketed and in their own right become part of the attraction to the restaurant. The executive chef position is competitive, and will be increasingly more competitive in a high quality hotel. Candidates for an executive chef position will be expected to have experience with culinary management, as well as previous experience with food control and labor cost, and menu development. Most executive chefs will have a culinary degree, but this is not necessarily required as many chefs have risen to the ranks by being trained on the job by chef mentors in restaurants where they have worked. Supporting the executive chef is a team of sous chefs and cooks. Since the executive chef spends the majority of this time on administration, it is often the responsibility of the sous chef for the day to day running of the kitchen. Depending on the size of hotel's restaurant operation, there may be one or a few sous chefs supporting the executive chef. Supporting the chefs will be numerous cooks with specific duties. For example, there may be a fry cook, soup cook, and sauce cook. Additionally, cooks are often given the task of foods that emphasize fast service. They grill hamburgers, fry eggs, toss salads; often working on many orders at the same time. Cooks tend to be less skilled than chefs, and this position is considered to be the most entry-level of any of the kitchen roles. For a person with a strong work ethic and ambition, the cook position is a great way to start a career in the kitchen. To find out more about chef careers, continue reading on in our Member's Section.